Episode 82 of the Doc & Jock Podcast features Board Certified Orthopedic Surgeon Dr. Jon Hyman. In addition to operating his own private Sports Med practice, Doc Hyman serves as the team Orthopedist for the Atlanta Hawks and Falcons. This real Doc is also famous for being a very outspoken PRO CrossFit MD. Taking on the opinions of many of his colleagues. In 2014 he even invited 40 CrossFit coaches to do a human cadaver lab so they could have an understanding of the inner workings of the human body. Doctor Jon Hyman is a Board Certified Orthopedic Surgeon who is an avid CrossFitter and advocate for the fitness philosophy. 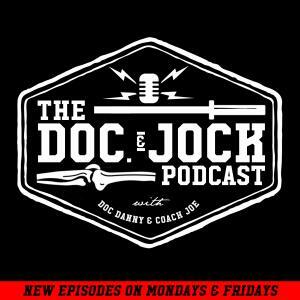 In Episode 82 of the Doc & Jock podcast he joins the conversation to talk about a range of topics including anatomical anomalies in athletes, keeping joints healthy for the long haul and how to pick the RIGHT surgeon if that situation ever presents itself. If you’re CrossFit this episode is a must listen for you! How did Doc Hyman get involved with CrossFit? What are anatomical abnormalities and how can you identify one. What are some common anatomical abnormalities that cause CrossFitters to get injured? If you have a anatomical “uniqueness” can you work around it or are you stuck with being injured forever? Are there any common anatomical “snowflake” situations that would mean that someone should never do CrossFit or any other high intensity fitness program again? How can a CrossFitter keep their body happy and moving for a long time? What does Doc Hyman think about fat doctors? Should doctors be fit? Was Doc Danny right for calling out fat PT’s? Doc Danny presents Doc hyman with a case scenario about a very common injury in CrossFitters (anterior hip pain) and Doc Hyman tells us how to solve it. If the day comes where you ever need to have surgery find out some questions you should be asking your potential surgeon to make sure they are the right fit for you and your sport. In 2014 Doc Hyman had a open cadaver lab for CrossFit coaches. Why would he do something like this? What does Doc Hyman think about pain management drugs?